Upon reading about the latest trend or best new revolutionary idea, how many times have you found yourself wondering why didn’t I think of that? Or maybe you had thought of that, even years ago, but didn’t share your idea or pursue how to make it mainstream? Or perhaps you’ve belittled the average joe-public who happened to be at the right place at the right time with the right product and got rich by doing so? 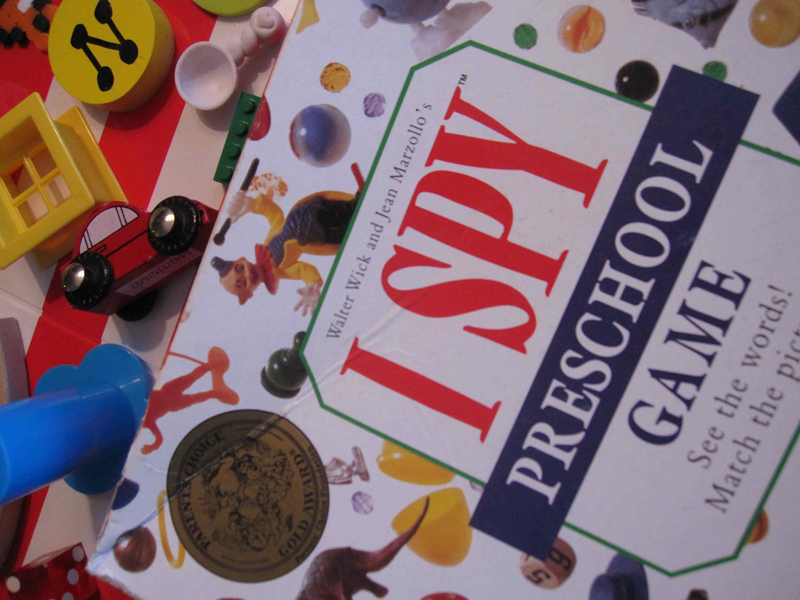 While the “I Spy” concept as coined and owned by Scholastic is celebrating 20 years, I can’t help but be a little bitter about their success because anyone – any average modern day parent, that is – can easily create an “I Spy” of their own using all of the little bits and miscellaneous pieces of random stuff in their own home. Case and point. Friday night. Sleepover. Game night. My 7-yr-old and her friend along with my 5-yr-old son and I come across the I Spy book. 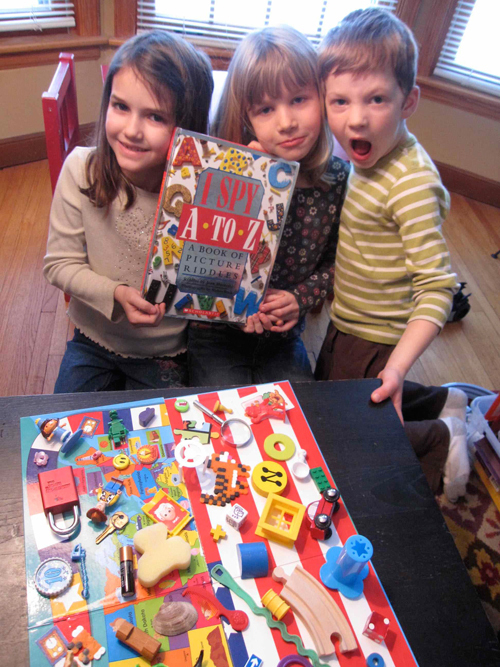 Over the years we’ve bought into I Spy everything – puzzles, games and books. I’ve studied the book pages and like how they come up with a theme and throw in random bits of nostalgia (I have wondered if there are official I Spy item collectors out there) and vary the size and color scheme of each photo. What we don’t have a shortage of is games and collections of lost die and game pieces. I have not been saving these for nothing. We choose the “Great States” gameboard background and each choose a square (note, there are states on half and the flag on the other because the board’s been ripped in half after frustration trying to find Rhode Island). We all have a quarter-section of the board that is our responsibility. Calvin puts a dinosaur in Utah and Ava’s friend places lego Woody in one of the Great Lakes. Each kid brings out a few containers of miscellaneous stuff from room storage. Stuff that annoyingly continues to pop up over the years in random places suddenly seems like it has a purpose. At least until we get the shot that’s going in our I Spy book. Along the lines of a game theme, we include a Lincoln Log, a chess piece, Feed the Mouse die and mouse, a Cootie leg, an earring and ring from Pretty Princess, Barrel O Monkeys, bubble makers, Matt from GuessWho, Dora dominos, Candyland, legos and a few Barbie shoes (not because they’re a game, but because they turn up everywhere). 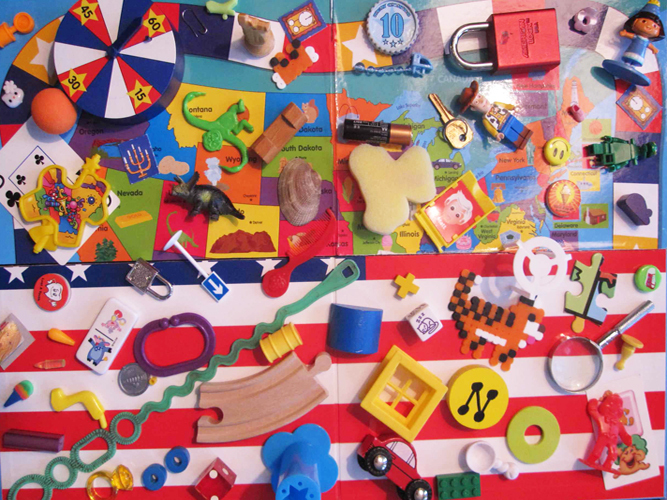 There are also magnets, a cat made of pixos, Lightbrite pegs, tic-tac toe pieces, a dinosaur, keys, locks, coins and a battery my son snuck in (over the state of MN) that I was not aware of during the photo styling. That’s him showing his love of the battery-operated game and toy. Me not so much. It was a deliberate attempt on my part to keep these games and toys and the like out. And of course, the final touch, a magnifying glass (the token trademark for I Spy). So now, maybe now, some of this stuff has run its course with our family. I’ve recorded it in time capsule / I Spy format. Through software on the web, one could magically take this image and transform it into t-shirt, mug, poster or calendar format. I can think of a hundred more themes for the stuff we have. Anyone want to buy an I-Spy original? I Spy: Junk and Treasures from Our Family’s Closet.